Shift Your Flower Shop Advertising Online? Still spending your annual florist marketing budget on Yellow Pages listing? While it may be intimidating at first, online marketing is one of the most efficient ways to reach a wide audience of potential customers for your flower shop. But on top of creating arrangements, running deliveries, and managing your own books, how many florists really have time to learn the ins and outs of the many online advertising services? If this sounds familiar, Google AdWords Express may be for you. Google Adwords Express is a simplified and affordable way of promoting your shop online. AdWords Express will handle the rest. Using this information, they’ll create an online campaign targeting potential customers in your area. Many online ad campaigns work off of what is known as Pay Per Click (PPC). In this set up, you pay Google, for example, every time someone clicks your ad. This requires much more tracking and can run up a serious bill. Google AdWords Express, on the other hand, takes the opposite approach. Your flower shop would create a maximum budget. Google will then estimate the number of people will see and click through your online advertisement. You ads will appear above or next to Google search results as pictured below. That doesn’t mean that everyone in the world will see your ad though, and that’s a good thing! Part of the set up process will be telling Google where you want people to see your ad. It can be in your neighborhood, city, or state. This ensures that there is a real chance that the people who see your ad will click through and buy their flowers from you. Of course, even the world’s best ad campaign isn’t worth very much if it’s not creating more sales for you. Luckily, Google Adwords Express provides ways to measure the effectiveness of your ad campaign. 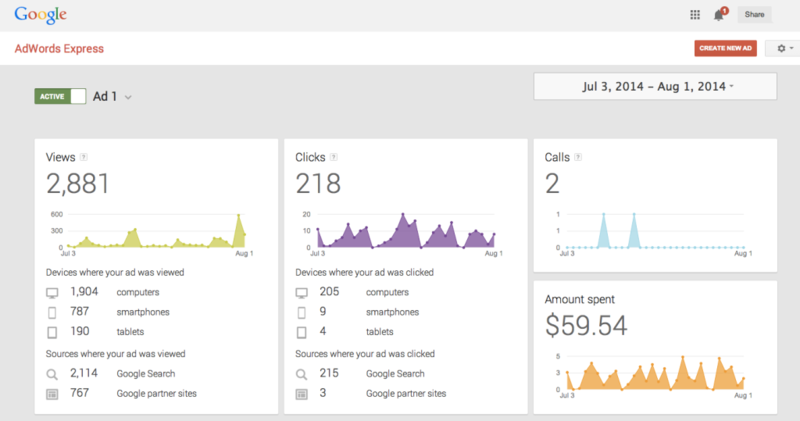 Their dashboard provides you with a comprehensive view of how many people have seen your ad, how many have clicked, what they’re viewing it on, and where they’re viewing it from. It also keeps track of how much your flower shop has spent, which depends on the number of clicks your ad receives. This extra level of transparency is one of the biggest benefits to online marketing. There is no real way to know exactly how many people see your Yellow Pages listing, TV commercial, or even a billboard. Google Adwords Express offers you detailed numbers on how many people see your ads, and how effective the ad is. 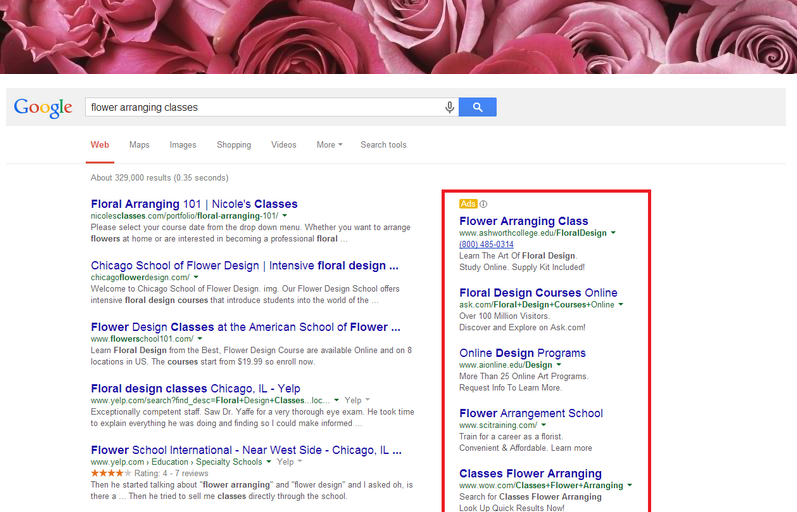 Google Adwords Express is well worth the investment for flower shops looking to boost their online marketing presence. It gives florists (who don’t have advanced degrees in internet marketing) a chance to make sure their flower shop is seen by a new crowd of potential customers without breaking the bank. Are you ready to bring your shop into the digital age of marketing? Feel free to share your experiences in the comment section below. Was using Teleflora Dove pos and am no longer a member of TF – dropped couple years ago but still using the Dove order/entry and it crashed so cannot get any records etc. off. I have it backed up but because the computer will not run Dove now cannot get the backup files. Any suggestions. Yes online marketing has made to sell your product very easy. You can buy flowers also there.